At the recent British Open, Hannah scored her highest score to date 15.950 in hoop! This placed her in first position and ranking first overall. Her team mates played good routines as well, especially at the Regionals where she came in 2nd overall. The British Team for the Europeans has not been finalized yet, but the potential team is looking strong! Hannah competed in the Aphrodite Cup 2016 in Athens, Greece, on the 11th and 12th March, Together with 5 other British Junior girls and 2 seniors. The junior team came 8th out of 21 countries competing, which included Ukraine, Russia, Kazakhstan, and Turkey, some of the top performing countries in the RG world. Her ball was her best routine of the competition being clean, the highest score for the Brit Junior team, and achieving Reserve1 for ball finals. Now looking toward British Open this weekend! Hannah won the Active Wandsworth Junior Sports Person Award for 2015 for all her achievements throughout the year. Hannah was unable to receive the award herself as she was competing in Estonia for her first GBR international of 2016. Hannah competed with 2 routines in Estonia hoop and clubs, did very well with these new routines scoring over 13s. Her next international will be Athens, Greece, The Aphrodite Cup. Her next international will be Athens, Greece, The Aphrodite Cup. Hannah also brought home gold at a London Regional on Sunday 7th Feb.
Merry 2015 Christmas from Hannah and her team and wishing you a winning 2016. English Junior Rhythmic Gymnastics champion in hoop. English Junior Rhythmic Gymnastics champion in ball. English Junior Rhythmic Gymnastics champion in clubs. English Junior Rhythmic Gymnastics champion in rope. English Junior Rhythmic Gymnastics champion in overall. British Junior Rhythmic Gymnastics champion in hoop. British Junior Rhythmic Gymnastics champion in rope. Significant achievements this year include competing internationally for GB at Serbia, Calais, Corbeille, Athens, Sofia and Varna. Was a finalist in five of these competitions, bringing home gold medals from Serbia, and ranking 7th in the world cup at Sofia, Bulgaria. Hannah has also been selected for the English and British squad who are presently preparing for the European championships in Israel in 2016. Hannah is one of only 6 girls to be selected for this privilege. As well as all of her demanding training, Hannah has also visited schools, nurseries and Gym clubs, inspiring and encouraging young aspiring gymnasts to reach for their dreams. Hannah this week attended at gathering of 50 athletes and gymnasts from a variety of disciplines, all recipients of sponsorship from Royal Bank of Canada through the excellent Sportsaid scheme. Athletes and gymnasts must be recommended by the national governing body of Rhythmic Gymnastics, and Hannah was recognised by them as a young British talent. It was an inspiring night, with athletes and gymnasts from all kinds of sports sharing their achievements. Hannah and her family are sincerely thankful to everyone who sponsors her efforts and aspirations as a British Rhythmic Gymnast. This is amazing! Hannah in 7th place at the Junior world tournament in Sofia, Bulgaria. Standing next to some of the world’s absolute BEST! Congrats Hannah – so proud of you! Keep going! Hannah standing in line with the world’s best, receiving her certificate. Senior British Gymnast Stephanie Sherlock also came seventh in the Senior competition. A great achievement. 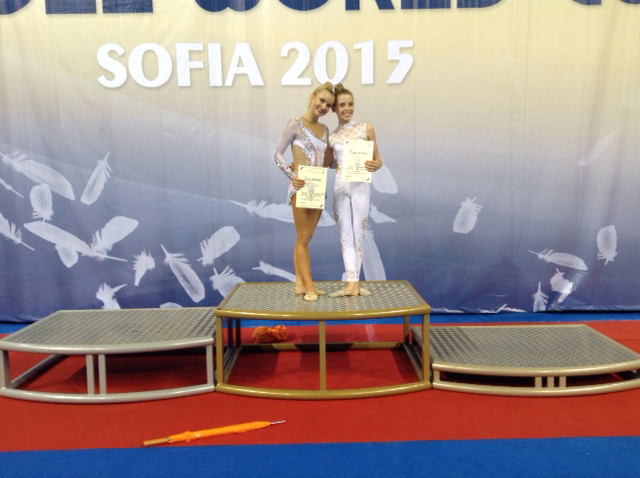 Hannah now moves into week of intensive training with world class coaches in Bulgaria, before competing again. 2 Golds, Silver and Bronze in the 2015 British Championships! Hannah just returned from the 2015 British Rhythmic Gymnastics as the Junior British champion in hoop and rope, together with a silver in clubs, bronze in ball, and the overall Silver medal. After sweeping the floor in the English championships just two weeks before with 5 Golds, expectations were high, and Hannah performed wonderfully, scoring the highest score of any junior in the competition for a flawless hoop routine. Her next competitions include the world championships, which are being held in Bulgaria this year. Hannah flies out to Bulgaria in 10 days time for an intensive 2 week Rhythmic Gymnastic camp where she will train and compete alongside the world’s best! Hannah has just returned from the 2015 English Rhythmic Gymnastics Championships as the 2015 English Junior Champion. With so many great up and coming gymnasts in the Junior ranks, Hannah was competing with girls aged 12-15, but her hard work, determination and a good dose of faith and prayer paid off. She won five gold medals – coming home with golds in ball, hoop, clubs, rope and the overall title – English Junior champion 2015. On the 20th June 2015 Hannah competed for Britain as a pre-junior in the 9th FRIENDSHIP TOURNAMENT in Belgrade, Serbia. Despite the airline she travelled with losing her luggage (with all her Rhythmic equipment in!) Hannah flew home with Gold medals in all of her events – Ball, Clubs and Overall. The British team did marvellously well, with every British gymnast coming back home with either gold or silver medals. A wonderful result, and very encouraging for Rhythmic Gymnastics in our country.